I suggest to discuss the different editions of Leroux's novel in this topic. Rare, very old, may be, the favorite one. Last year I've started to collect editions of Leroux's novel. While googling, I've found very rare first editions (sadly, I can't buy this books now ). One of them is Mexican edition, published (you won't believe!) in 1910, i.e. earlier than the American one! If someone has the first French edition, please share some pictures. I'm very interested in binding and the quality of paper. I'll post later the pictures of 1910 Italian and 1926 Czech editions. Klavirista wrote: I suggest to discuss the different editions of Leroux's novel in this topic. Rare, very old, may be, the favorite one. I had no idea! How cool, thanks for sharing. I've been looking for the first Danish/Norwegian edition for years, but no luck so far. I have two copies of the first first first edition, i.e. 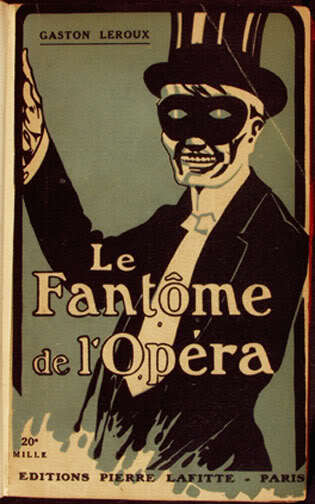 the French one published by Lafitte. My flatmate has a hardback version from 1910 that came out AFTER the ones I have - I should take a picture of it. 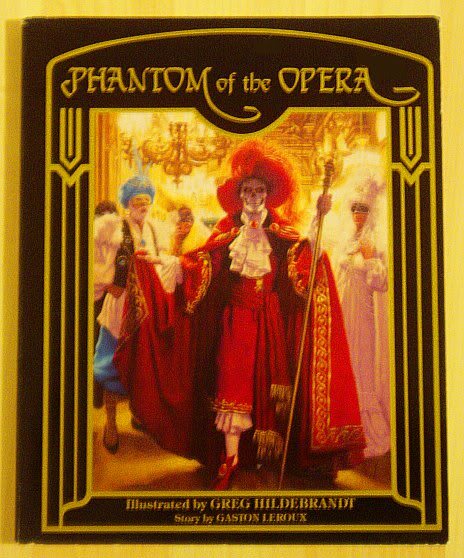 A favourite of mine that I own is the one illustrated by Hildrebrandt with a forward written by Sarah Brightman. I love the illustrations. There's a really gorgeous edition that uses (alas) the standard de Mattos English translation published by Eaton Press that looks incredible, but it usually goes for hundreds of dollars on eBay. There are only four b/w illustrations inside, but it's truly wonderful, I agree. I saw Easton Press edition in two different bindings: one is blue with golden ornaments and the other one is dark with small golden masks. Are they the same? "One of them is Mexican edition, published (you won't believe!) in 1910, i.e. earlier than the American one!". Actually, it's not surprising that it was translated to Mexican before English, because French and Spanish are both langues based off of the Roman langue, which is called Latin; English uses words from all over the World, and thus would have been harder to translate the book too. TwelveInchTailor, the Reprint from UK in the photo above your last post is available through AbeBooks, Amazon, or Book Finder I recommend Book Finder. 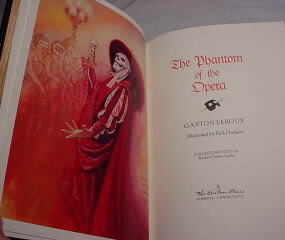 I saw the illustrations on the Bonus Features on the second disc of my The Phantom of the Opera - The Ultimate Edition (1925 Original Version and 1929 Restored Version) set, and as soon as my Mom got home from my sister's music lesson I told her about the "Book! Color picturs! Book" is about what I said. My Mom gets out her Laptop and we start looking, we find one from 1911 for $50.000, and so, I ask My Mom "Isn't there one like my OZ books" so she goes to Book Finder the book in the photo above your post arrives three weeks later and when I see it on the table and start laughing until my Mom tells me to stop. Then I start saying "I got the Precious" from Lord of the Rings until my Mom tells me to stop that too (surprisingly) and then I tell her "Thank You for buying me the book Mom" and then she says " No I didn't you bought it" so then I ask "Then why is there still $30 on my allowance card?" Now I must say, while the de Mattos translation is incomplete, This is still, out of the copies of the novel in my collection, my favorite, because it reminds me of the first copy of The Secret Garden that I read.